Paul G. Harris and Graeme Lang (eds. ), Routledge Handbook of Environment and Society in Asia (Routledge, 2015). Nowhere is the connection between society and the environment more evident and potentially more harmful for the future of the world than in Asia. In recent decades, rapid development of Asian countries with very large populations has led to an unprecedented increase in environmental problems such as air and water pollution, solid and hazardous waste, deforestation, and depletion of natural resources and extinction of native species. 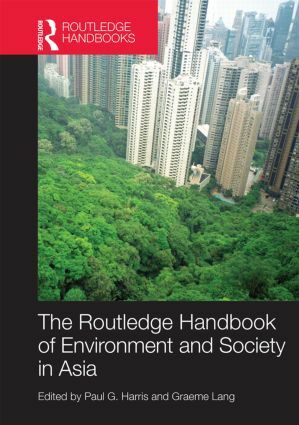 The Routledge Handbook of Environment and Society in Asia provides a comprehensive survey of the cultural, social and policy contexts of environmental change across East Asia. A team of international experts critically examine a wide range of environmental problems related to energy, climate change, air, land, water, fisheries, forests and wildlife. The chapters demonstrate that, with nearly half of the human population of the planet, and several rapidly growing economies, most notably China, Asian societies will determine much of the future of human impacts on the regional and global environments. As climate-change related threats to society increase, the book strongly argues for increased environmental consciousness and action in Asian societies. The handbook is intended to be an essential companion for students, scholars, policy makers and researchers working on environmental issues in Asia.